Aside from a passport, camera, and a sense of adventure, what’s the most important thing a traveler should own? I’m pretty sure we can all agree that compact, durable luggage that’s easy to carry and has a wide variety of options when it comes to storing your clothes, gadgets, and other necessities is an absolute must. 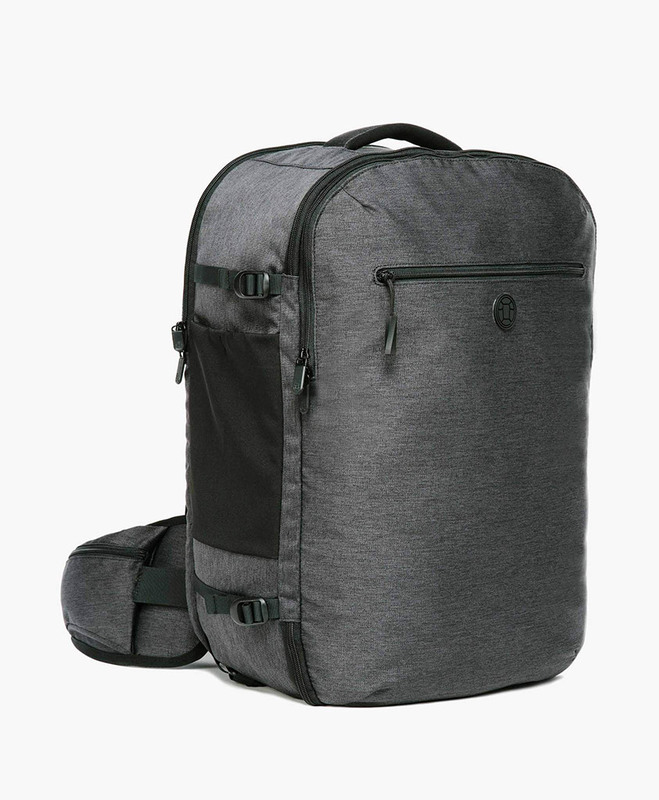 In the review below, we’ll be taking a closer look at the Tortuga Setout Backpack, a spacious, lightweight, full-sized carry on perfect for travelers who enjoy extended city breaks and multi-week trips. To those who are looking for a lightweight carry on backpack with lots of space and excellent organization all while practicing the the art of minimalism -– you’re going to absolutely love the Tortuga Setout Backpack. Let’s face it, we’re all fed up with hauling our luggage through airports, bus and train stations. In this day and age, who doesn’t want their possessions to be within reach and organized to the point where you know exactly where to find each and every item? Heading out on a trip and ready to kiss those additional luggage costs goodbye? Well, let’s take a closer look at the Tortuga Setout Travel Backpack below.. Pro Tip: Are you an organization freak or are you an explorer? 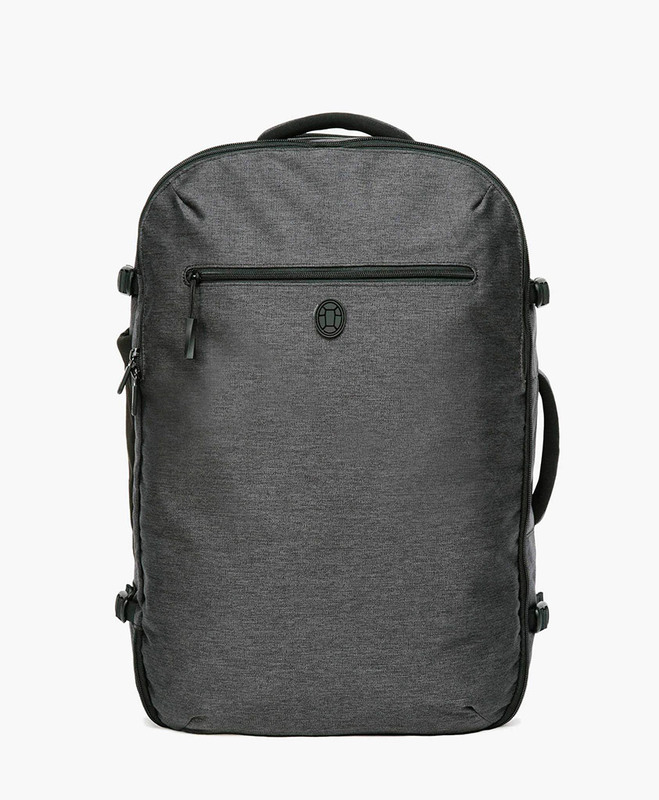 The reason I ask is because Tortuga offers what they call “Bundle Deals” which offer up great discounts on the Setout Backpack and they come along with some very cool accessories. After reading this review, please be sure to check out both the Tortuga Setout Organizational Bundle and the Setout Exploration Bundle. One of the first things you’ll notice about the Tortuga Setout is that it’s incredibly sturdy. It’s also astonishingly light at only 3.3 lbs. Even though you’ll be carrying everything on your back, the backpack won’t feel as heavy other backpacks on the market. The polyester build material is water-resistant, extremely durable and can endure a lot of weight if you plan to pack for both warm and cold destinations. The design coupled with the materials used in making the backpack allow the forces of the weight to be distributed evenly across your body. The design itself is sleek and minimal, and feels very 21st century. One of the highlights about the build and the materials used when making this bag is that it doesn’t scream tourist and actually has a classic urban look that helps you blend in with the crowds. As mentioned above, if you travel a lot, you know that durability is a high priority when it comes to choosing the right travel backpack. On one hand you’re looking for something that you grab and can take on-the-go with you in a minutes notice while on the other hand you’re looking for a pack that will truly last and remain in good shape even after bouncing around the world. The Tortuga Setout Backpack uses materials that helps the pack stay strong and keep its shape no matter which destination you choose. 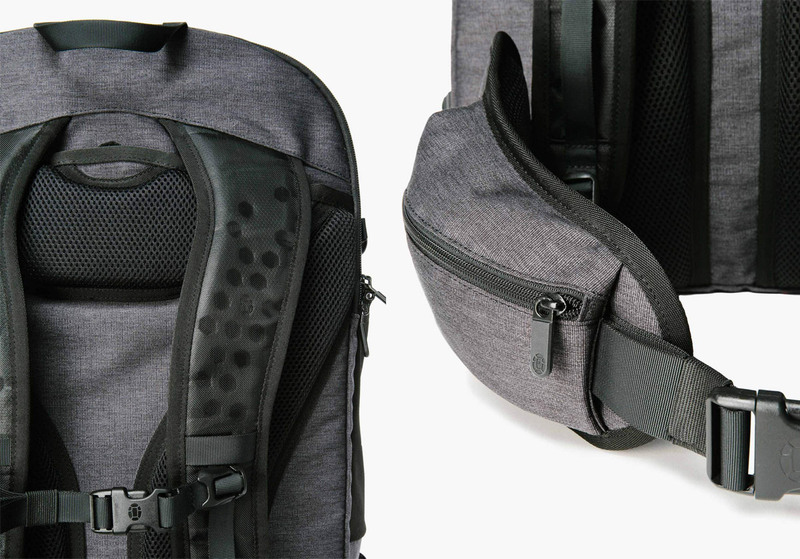 Let’s take a closer look at the materials used on the Tortuga Setout Backpack below. Injection molded foam (Straps and Removable Hip Belt) – Carrying the Setout on your back simply feels great. The shoulder straps are incredibly comfy, which come as no surprise since they’re made with injection molded foam. They easily form around your shoulders over a short period of use, so the backpack ends up feeling like it’s a part of your back. One of the best features of the Setout straps is that you can easily disconnect the bottom carabiner and hide the straps away. This is perfect for situations where you need to pass through narrow spaces or when you’re placing your backpack on the conveyor belts at airport security. The hip belt does a great job of keeping the load off of your shoulders and spreads the load out more evenly. While I rarely use the hip belt on my travels (unless I’m traveling for a long period of time and carrying all my gear), it is amazing to be able to strap them on when necessary. Another bonus is that each hip belt has a convenient little pocket for items which require easy access such as passports, headphones, change, ID’s, etc. YKK Zippers: Where many backpacks and suitcases fail is at the zipper. A lot of the time when buying a backpack, even at a premium price, you might find out that the zipper is either faulty or it soon becomes faulty. Luckily, the Tortuga Setout doesn’t have problem as it uses YKK zippers. For those who don’t know, YKK is a Japanese brand of zippers that designers all over the world love to use. It’s safe to say that the company has perfected the craft of making zippers after decades in the business, which is how it became an established brand in the apparel industry. Duraflex Buckles: The problem with most backpack buckles is that they can be pretty easy to crack and break if you don’t treat your bag with care. Fortunately, with the Tortuga Setout Backpacks duraflex buckles, you don’t have to worry about this issue. The buckles on this pack can withstand substantial force, so you’ll be able to carry it without any worries of the buckles failing on you. Long-Lasting Quality: At the end of the day, Tortuga continues to prioritize quality materials over materials that simply look cool and this ensures that you will be purchasing a bag that you’ll be able to carry with you for years to come. It’s worth mentioning that the ideal fit for the Setout is a 17-19” torso. Other sizes work well, of course, since the straps and hip-belt are adjustable. 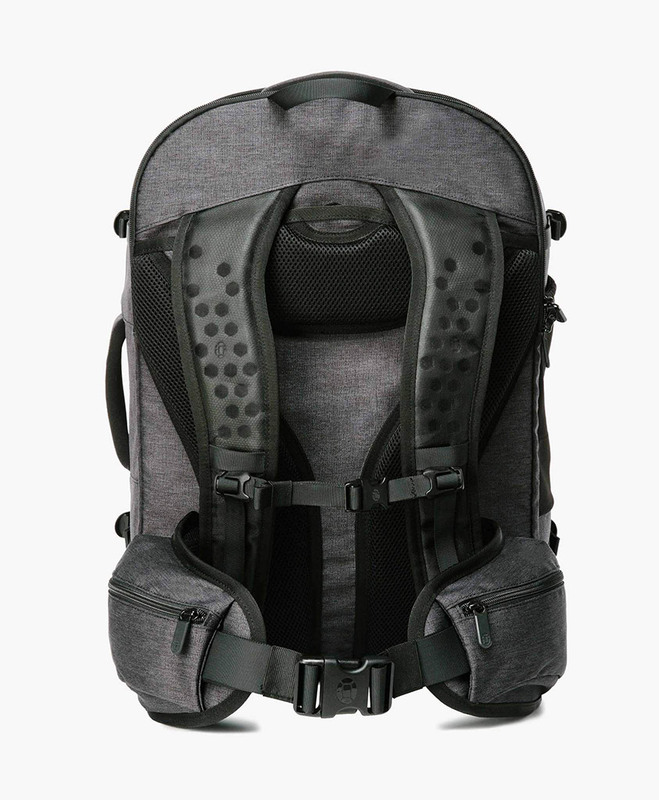 Also the padding and injection folded foam allow to comfortable conform around your torso, so almost any torso size would be okay for carrying the backpack. The Tortuga Setout measures (22″ x 14″ x 9″) and it weighs in at 3.3lbs. It’s compact and light, which are characteristics of a great carry-on bag. (Note, however, that some budget airlines only allow carry-ons up to 20 inches in length). Therefore, depending on how strict the airline is, you might have to check-in this bag before you board your flight. Generally speaking, this bag flies well under the radar but we do have to let you know ahead of time that this is a possibility. If this does occur, make sure that you remove your valuables and anything that is fragile since the sailcloth material and Ariaprene foam are not thick enough to absorb drops that your bag might endure when checked in. The Tortuga Setout functions as both a backpack and a suitcase. You have two main pockets which are front loading (1 laptop sleeve pocket as well as a front accessory pocket). The main compartment of the Setout is what really sets this pack apart from the majority of other travel backpacks out there. Having a clamshell design allows you to access your gear like you would if you had been using a small carry on suitcase. 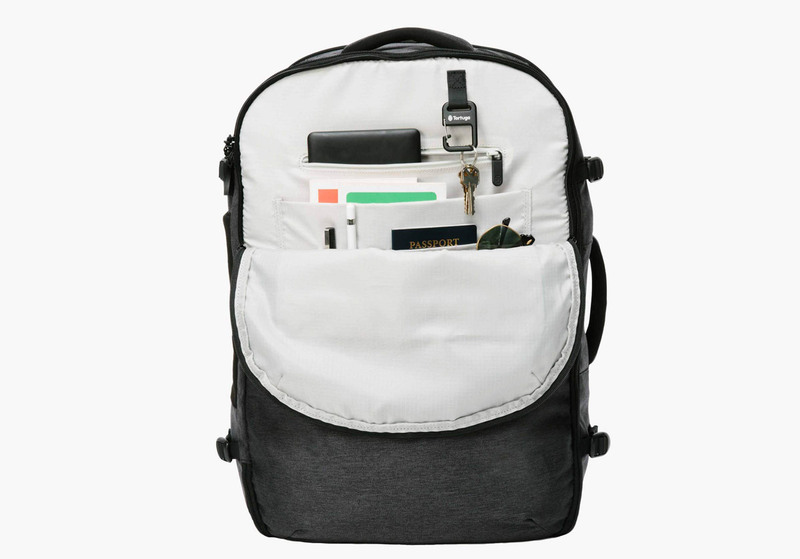 The Tortuga Setout Backpack comes in one color — and it’s the sleekest, sexiest gray you’ll ever see. The pack has one top handle and one side handle for those who prefer to hide the backpack straps and carry their backpack like a briefcase. There’s one small yet deep external pocket on the front of the pack which makes it easy to access things you need on the fly. Also, the main accessory compartment is as deep as the pack and is a great place to store your keys (internal carabiner included), passports and whatever other documents you want to keep handy and within reach. 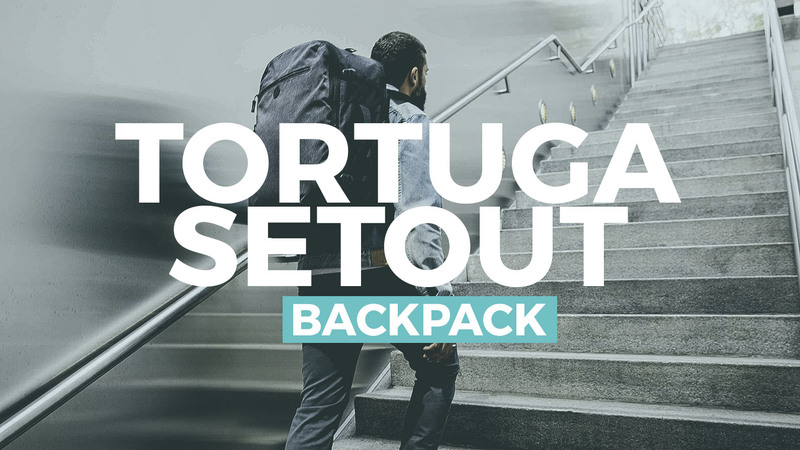 BUY THE TORTUGA SETOUT BACKPACK NOW! By far the most important part of the Tortuga Setout is its main compartment. Aside from being light as a feather, and easy to carry, loading it with things is its primary feature after all — and it sure delivers on that. Due to the fact that the Setout opens like a suitcase you have access to everything inside within mere seconds. The dimensions and materials used allow for top-notch packing capacity, and since it’s front loaded, it’s extremely easy to pack everything you need. A compartment of this size also pairs well with packing cubes — I never travel without these packing cubes no matter which piece of luggage I travel with. Plus, the material on the sides of the pack are not as rigid from the inside so you have a little extra breathing room when packing all of your stuff. On the front of the backpack you’ll find a typical zippered backpack compartment just like with any other backpack — only better. This front compartment is spacious and a great spot for storing your headphones, passport, and even a small notepad. Fortunately, with the outside materials of the backpack being water resistant, everything you place inside this compartment will be perfectly safe from the elements. Behind the zippered pocket on the front, there’s another storage compartment which extends from the top to the bottom of the pack. It’s deep enough to store a lot of things, and has several pockets inside where you can store documents, papers, passports, pens, plug adapters, portable bluetooth speakers and other smaller trinkets that you want to place in it. Looking for a place to keep your laptop safe and sound? Fortunately, the folks at Tortuga have you covered. Thankfully, you’re not limited to only a laptop or a tablet, because you can easily fit both inside and both have their own dedicated sleeves for storage. It’s also important to mention that the laptop and tablet sleeves are suspended a few inches above the bottom, so even if you drop the backpack on a hard surface, there won’t be any damage on the laptop or tablet. This backpack is simply spacious and has just about everything you’re looking for in a travel backpack from start to finish. Even if you were to ignore the build quality of the pack and the impressive list of specs, you’ll easily come to the conclusion that this is one of the best travel accessory purchases you’ve ever made. Rarely does a backpack offer so much space and convenience, and if you’re looking for both, the Setout is a fantastic choice. With so much space offered with the Tortuga Setout, it’s almost a shame not to utilize it properly. Where many backpacks fail is how they’re loaded and it’s tough to keep everything organized if your backpack is top loading. Thankfully, Tortuga created the Setout to open like a book so you won’t have that problem. Organization is a key element that every traveler needs to be more concerned about. It’s an important part of every trip, and if you’ve already organized every other part the trip, why not focus on the packing too. 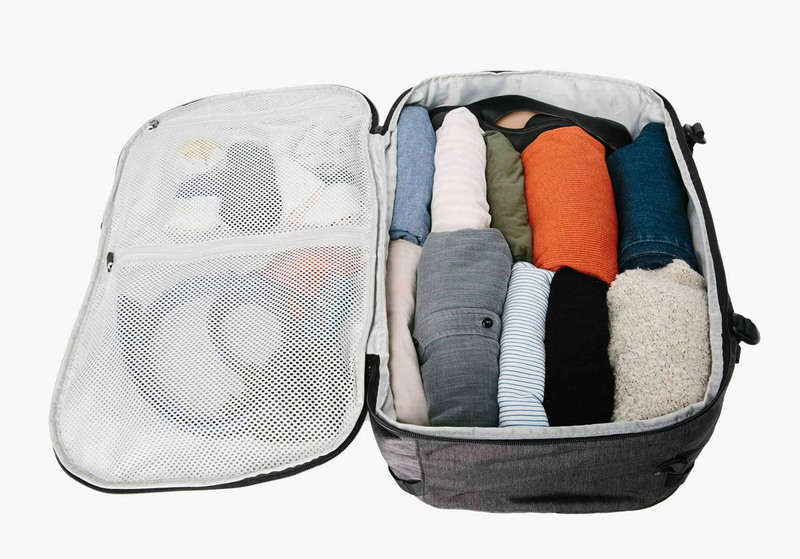 If you’re especially concerned about organization, and want everything to neatly packed, with everything it its place, packing cubes are the way to go. There’s a wide variety of brands which you purchase, but many of them are cheap and ineffective. I’ve personally found that the materials used on the cheap packing cubes can easily tear under stress due to the use of cheap materials and flimsy zippers. If one tears, or its zipper breaks, it’s back to square one. The better packing cubes are a bit more expensive, but are well worth the price. Tortuga have also made their own packing cubes from the same materials as their backpacks. They’re sturdier and more resistant to wear-and-tear caused by frequent travel, and any traveler that finds themselves on the road more often than not, should definitely consider using them. The Tortuga packing cubes can be found here, and while they’re slightly more expensive than some of the other brands, they’re extremely well made and of high quality. The first step to organized packing is knowing what your airline’s policies are when it comes to carry-ons and other luggage. What’s the weight limit? What things are not allowed in the plane? What things are allowed in carry-ons? Make sure that you do your research prior to your trip, especially if you are using an airline that you haven’t used before or are flying for the very first time. This will prevent any delays and problems during check-in. Do you need light layers and swimsuits or thick layers and warm coats? Do you need flip flops or boots? Will you be going on a fancy dinner? Or are you going somewhere more outdoorsy and casual? By keeping your destination and itinerary in mind, you’ll be able to pack the appropriate clothes for your trip. Aside from taking note of your clothing items, you should also make a list of all the tech and equipment that you wish to bring. Lastly, make a list of all the miscellaneous things that you need to take with you. These include toiletries (especially if you’re not staying at a hotel where these things are provided), makeup, a book or two, sunscreen (for warm destinations), etcetera. When creating your list, try to be as specific as possible so you won’t forget to bring anything. For example, you might write “toiletries” and then forget to bring your toothbrush. Keep this list with you when you travel, whether you make a written copy or keep one in your phone. This will help you keep track of all of your belongings when you’re packing up before going home. Overpacking is a common problem for travelers. To avoid overpacking, plan your outfits beforehand. Keep your itinerary in mind, and then plan each outfit accordingly. A night out, a hiking trip, a beach day — pick the right clothes for each activity. One of the best ways to avoid overpacking is to simply plan on washing your clothes during your trip. If you’re going on a two-week vacation, you pack clothes for a week, have them washed during the weekend, and then use them again the following week. If you’re looking for a backpack that you can carry with you all across the globe, the Tortuga Setout Backpack is the perfect choice for you. As mentioned above, it’s built with durable materials that resist wear and tear and last longer than conventional materials that most other backpack brands use. The sleek and simple design of the pack gives you a lot of options when it comes to customizing it to your packing style. When paired with the Setout Packing Cubes, you’ll be able to stay organized all throughout your trip. Overall, the Tortuga Setout is a great investment for those who love to take short and long trips both domestically and internationally. Light, perfect and durable for any type of trip — I highly recommend you pick up a Tortuga Setout Backpack today. You might also enjoy my reviews on the Tortuga Outbreaker and the Tortuga Homebase Duffel (my favorite travel duffel at the moment).